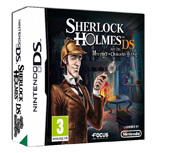 It’s once again time to don on your detective cap, pop in a pipe and be transported back to Victorian England for another challenging puzzle game for the Nintendo DS as Sherlock Holmes. 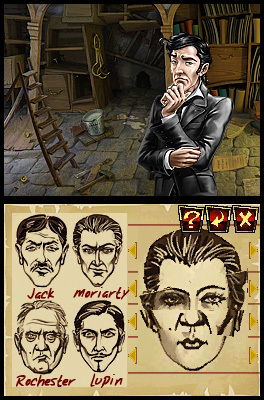 The game is called Sherlock Holmes and the Mystery of Osborne House which pits this famous fictional detective against his nemesis Professor Moriarty and other diabolical clues. Your goal in Sherlock Holmes and the Mystery of Osborne House is simple, return the stolen genealogical records of Queen Victoria and to hunt down those who is responsible for this hideous act that may jeopardises the Royal Family. 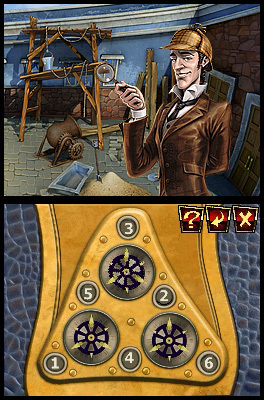 For those who played the previous Sherlock Holmes games before from this developer, Sherlock Holmes and the Mystery of Osborne House (SHATMOOSH) is of a similar vein and uses the point and click (touch screen with stylus) interface of those classic hidden object games with a healthy dose of puzzles along the way. Joining you on your adventures is Doctor Watson, Sherlock’s most trusted friend and colleague and should you get stuck in a particular level, there is a help system available which makes this game perfect for a variety of gamers from young to old. Even though the original Sherlock Holmes novels were quite dark, this game is opposite, hence its G rating. It’s good that the game can be played by children, however it does distract a little from the original themes and makes the story a little too light at times. As you progress through the game, you will meet a variety of characters who will point you in the right direction and this is where the gameplay comes into action… Riddles, Puzzles and Brain Teasers. There are some cool mini-games like face matching, pattern/colour/shape matching, finding objects to unlock other areas of the game and other brain teasers such as cogs and timers. These are nicely merged with the story and because they are so different, it helps keeps things fresh and interesting. Graphically, SHATMOOSH is a good looking game on the Nintendo DS thanks to its hand drawn backgrounds and cartoon like characters and environments. The environments are well designed and the animation included in the game works well with the gameplay, especially with its interactivity with the stylus. 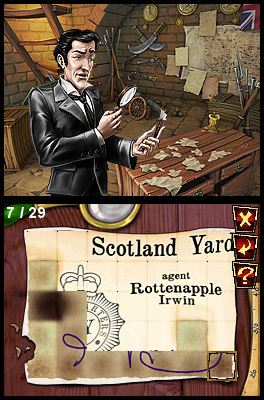 Certain parts of Britain have been faithfully recreated like Windsor Castle and the British Museum as you hunt for clues. The music suits the game and there are plenty of sound effects included in all facets of the game but unfortunately it doesn’t try to better itself in this department and is a little lack lustre. In conclusion, the developers have managed to create a very engaging casual game that contains a decent story and that famous puzzle/brain teaser gameplay which allows this title to be played by all gamers. One problem... it was a little too short but it's still worth the gaming effort for such a good all round casual gaming experience. A great case that will lead you throughout London, its area, and the Isle of Wight. Play, meet and interact with famous characters from 19th century England: Sherlock Holmes and his nemesis, Professor Moriarty, Doctor Watson and even Queen Victoria. Use your logic and your stylus to crack dozens of puzzles and brain-teasers! A help system is there to help you: unlock precious clues that will prove to be essential when confronted to tougher puzzles.